The epitome of print education for graphic designers. Can I Print This Digitally? Not sure? Get the ultimate cheat sheet delivered to your in-box along with design tips. Color systems and models are the languages we use to classify, describe and render color. Like any industry, it is part of the jargon – the tech talk of graphic design. These models are important because they use a precise language to describe precisely how color should be rendered. You as a designer get this even if you do not know it. You see color differently than a non-designer. Your programmer friend may call a paint color pink but you would correct him and say, it’s shell pink. Each color model represents a range of colors. The reproduction of the color model is limited by the device on which it is rendered. This is referred to as device-dependent. Gamut refers to the range of colors represented by a given model. The widest gamut of all is natural sunlight, the “spectral color gamut,” which can be measured with a device called a spectrophotometer. In the world of printing we compare the individual color models to the spectral color gamut. That is the colored area in these gamut diagrams. This background diagram that is shaped like a sail was developed in 1931 (!) and still holds true today. It is known as the CIE 1931 model (also known as LAB). 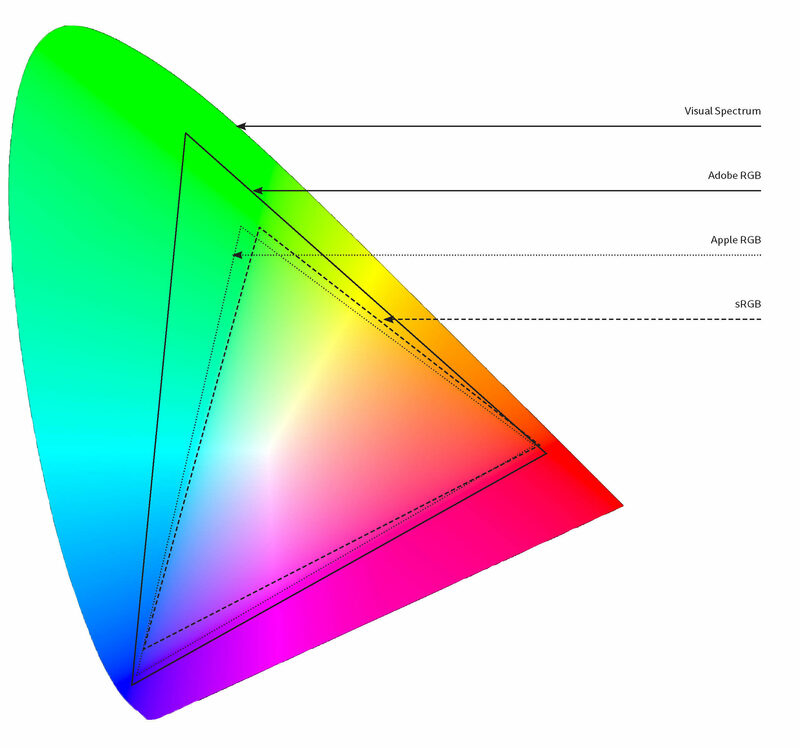 The left diagram shows three varieties of RGB gamuts (yes! not all RGB gamuts are the same!) The right diagram shows the gamuts of various printing processes. Other color models exist. 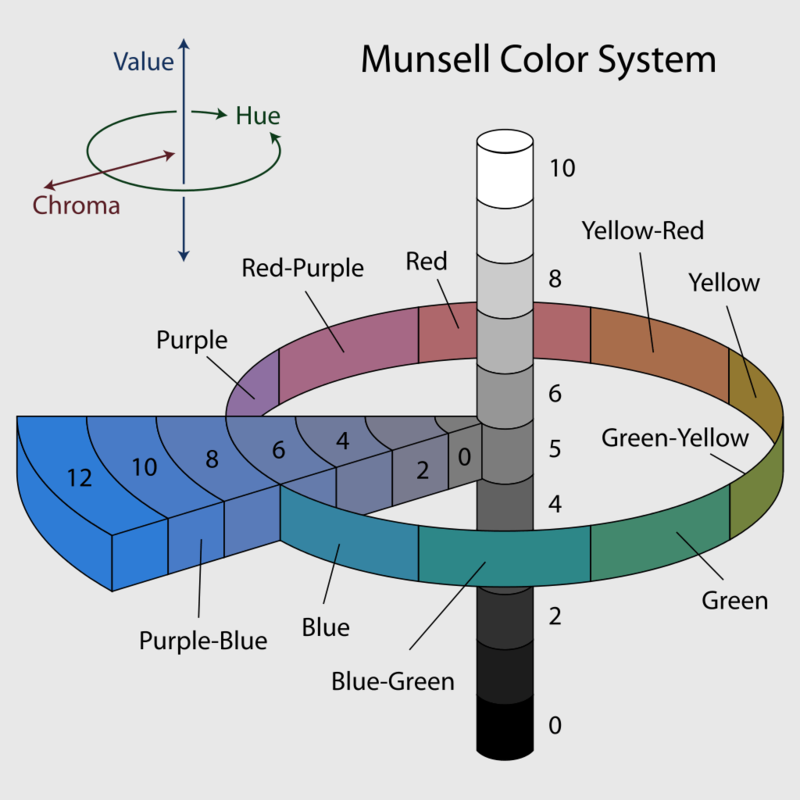 The Munsell Color Model here is a 3D rendition of the LAB model where each hue (color) can be more or less saturated (chroma). That is the 12 to 0 valuation in the Blue band below. 12 is the most pure rendition of that color and 0 is the least saturated. The same color can be lighter or darker, represented by the column in the center. Each variation of each shade of blue can be rendered into a 3D point in space. That is essentially what LAB values map. The closest reproduction to the visual spectrum that we can reproduce is is the “Hexachrome gamut,” which is rendered by Cmyk (Cyan, Magenta, Yellow, and Black) plus Hex green and Hex orange inks This can also be called HiFidelity or HiFi printing. There are other workflows that employ more colors in addition to CMYKOG, for brevity’s sake I am covering the most common here. 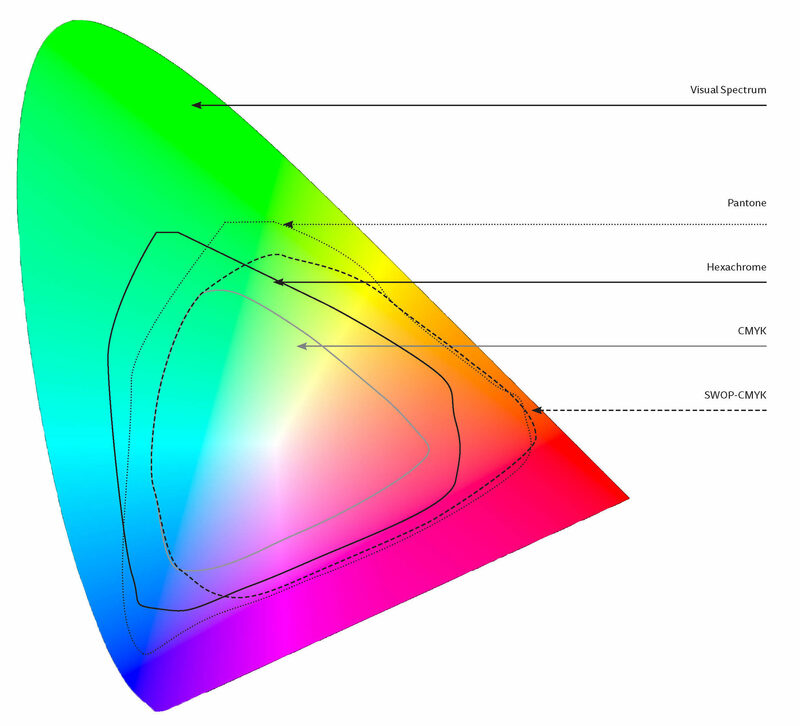 Following the Hexachrome gamut is RGB, which is rendered by monitors, then the Cmyk+ ink sets, which include additional colors such as light cyan, light magenta, and light black, and finally Cmyk rendered by Cmyk devices such as printers and presses. Here are the six models you should know when designing for print and preparing your files. Hexachrome. Cmyk plus Hex orange and Hex green. This proprietary system was developed by Pantone and requires a Hexachrome rip. Cmyk+. This color model can be rendered on an inkjet press with additional inks such as light cyan or light magenta or on a conventional sheet-fed press with additional touch plates such as green or orange or red. Cmyk. Cmyk is a printed color system that uses four colors—cyan, magenta, yellow, and black—to represent millions of colors. Rgb. RGB is a transmitted system, such as what you see on your television and computer monitors. Elements and files built in RGB must be converted to another color model in order to print. Match color. Match color is when you cannot find a chip that is the color you want. For instance, if you want the exact turquoise in that sweater your mom knit you in fifth grade, give the sweater to your printer to match the color. It may be more difficult for your printer to maintain consistency from batch to batch of match color depending on what type of ink mixing system the printer has. The newer systems are more accurate than older, analog systems. Pantone. The Pantone Matching System, now called the Pantone Plus Series for Graphics, is a method of specifying color from paper to textiles to plastic. When a color is specified using this system, there is a standard so that everyone that uses the system understands exactly what is meant by 485U and why it is not the same as 485C. Pantone has several different color specification systems. Cmyk coated and uncoated are invaluable tools for designers who are just starting to give the specifications for color (spec). You will be able to see the color you are building on your screen in print, or get really close.